We’ll admit that we hadn’t heard of Simon Rogan before hearing about his two openings in Hong Kong. 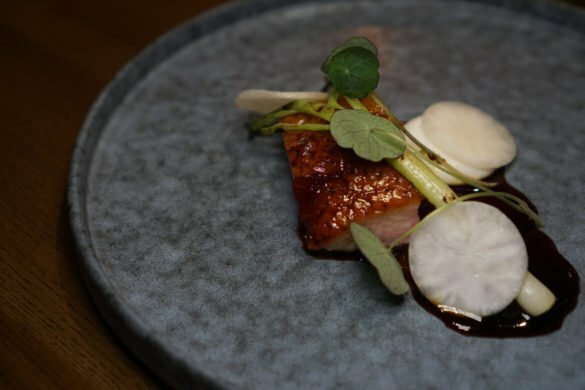 After finding out that Roganic’s origins lie in a small restaurant and luxury lodge in the Lake District a few hours from London, we forgave ourselves for not being uber familiar, but we quickly realized this was a chef (and team) we needed to know more about. We’ll be honest, we’re not quite sure what to make of the location. Roganic, just a few weeks old at this point, is set in a (to our foreign mind) seemingly random mixed-use skyscraper near Central, opposite its very-heavily-booked-in-advance sister restaurant, Aulis. Then again, it’s probably as normal to locals and unusual to visitors as Dubai’s need to have every restaurant located in a hotel. 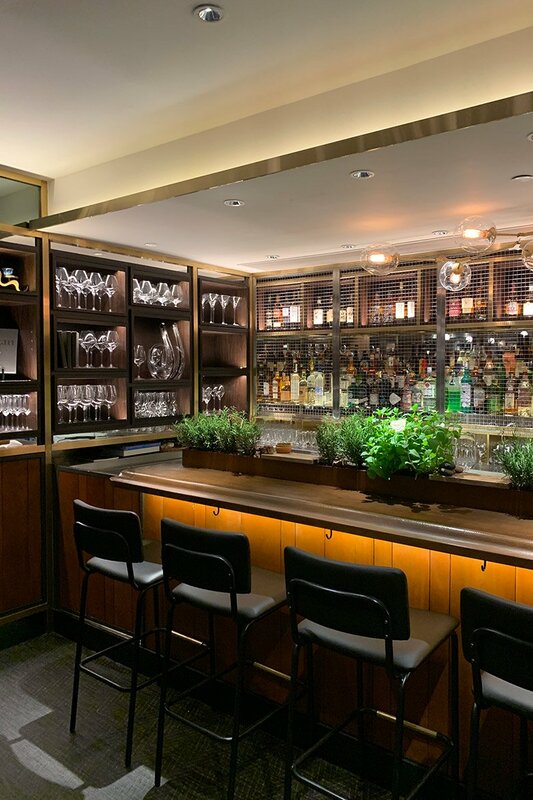 It’s a pretty set up – there are tree trunks as room dividers, plants growing on the wall and the branches that cover the roof come from the area where the original Roganic is located, apparently. 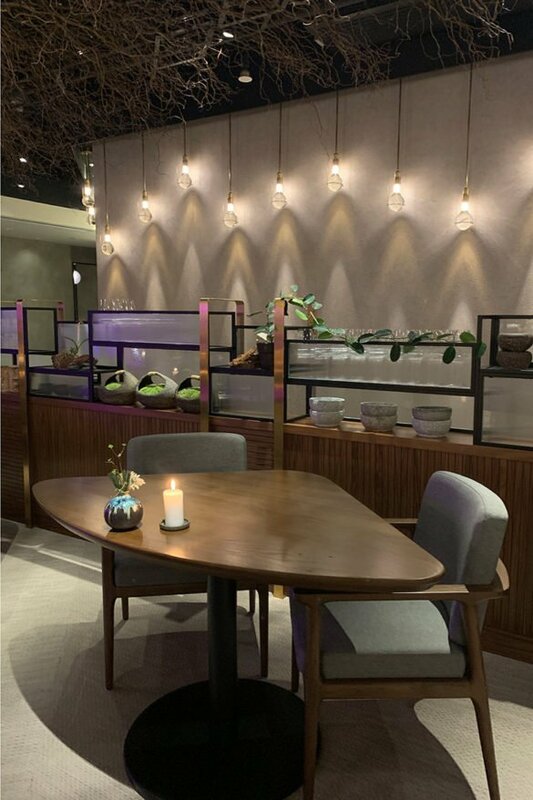 The vibe is modern Hong Kong, yet very earthy – fitting, we suppose, for a venue whose name is a play on organic. 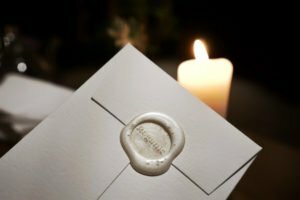 Something we notice about our experience right from the start is the service. It’s friendly, personable, warm and attentive. 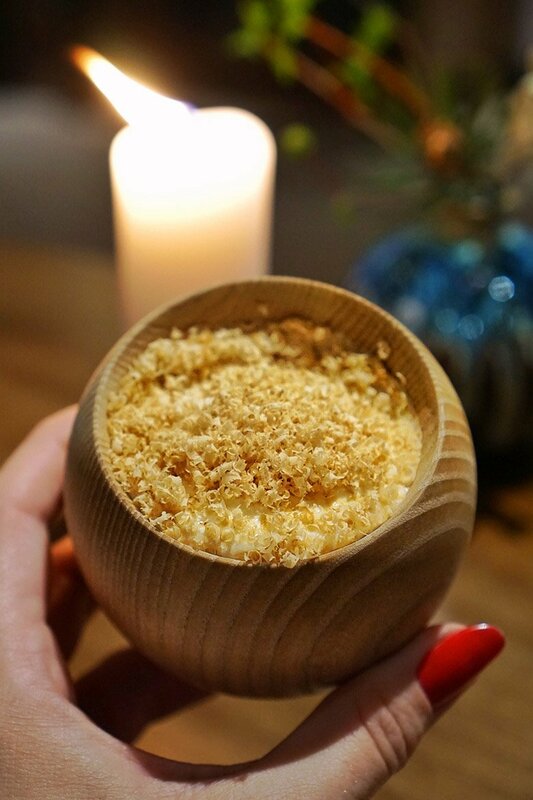 It’s service that isn’t afraid to have a giggle with you, should that be the personality of the table (always, ours). That’s something we rarely see if we’re honest, and we love it. We’re delivered a wax sealed, personalized menu – and while the menu may seem sizable at 15 courses on paper, in reality, many are small and overall, the meal is perfectly portioned and paced. The first six dishes are amuse bouche sized, forming the snacks, followed by the bread, four larger savoury courses and five sweet (we had an extra ‘cheese’ course added in). 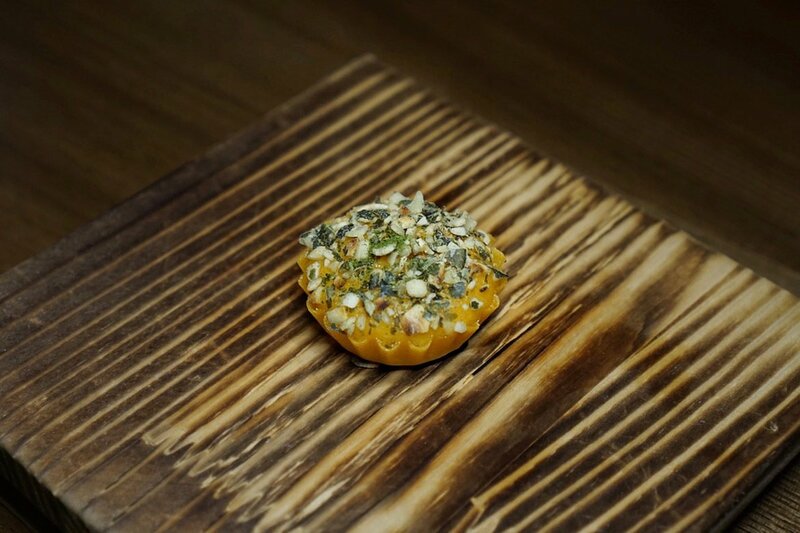 A petite, frilly tart of pumpkin, nashi pear and bay leaf is our first bite and it’s oh so pretty, bringing back memories of Geranium’s pork neck tart. 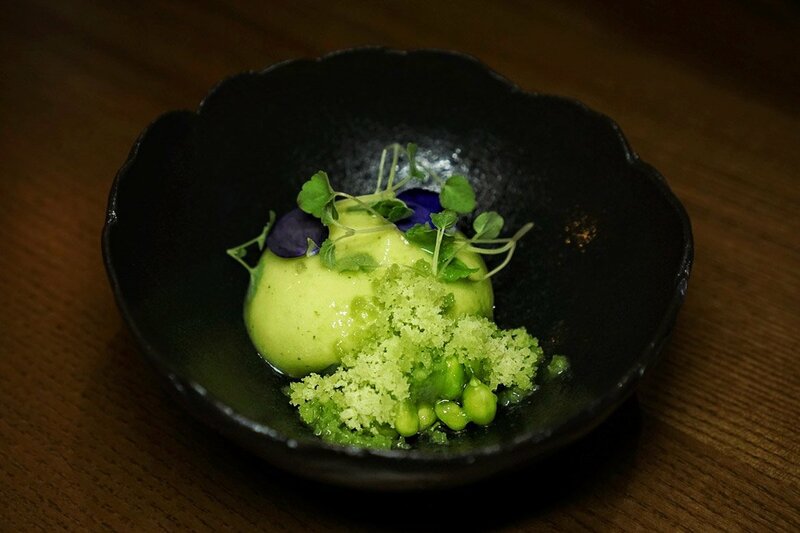 The next dish of Hong Kong pea is right up our alley (we love peas), followed by a duet of snacks – truffle pudding (mind-blowingly good) and wafer, fermented mushroom puree, yeast (probably the only dish we’d delete from the tasting menu). 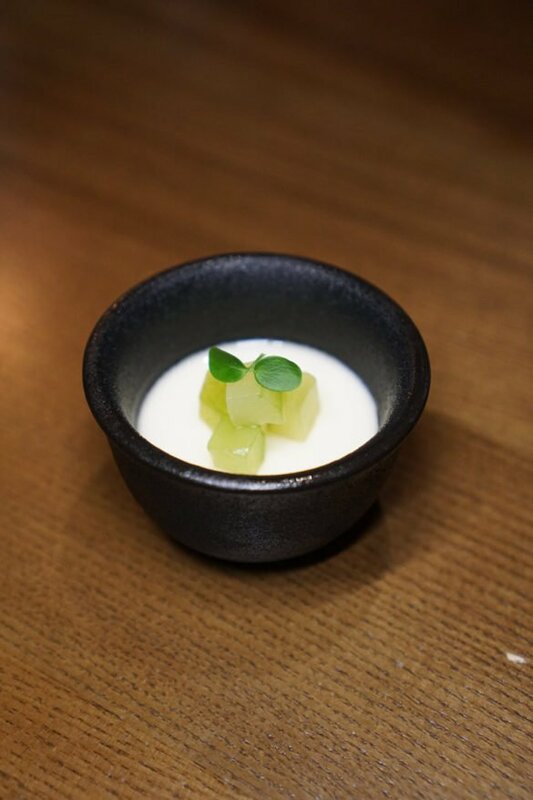 Next is leek and fennel, taking the form of a custard and chilled cubes – utterly delicious, as was the salt baked celeriac and black garlic (even if we are admittedly a little over seeing black garlic at the moment). It’s been an amazing array of snacks thus far, but now comes the bread. 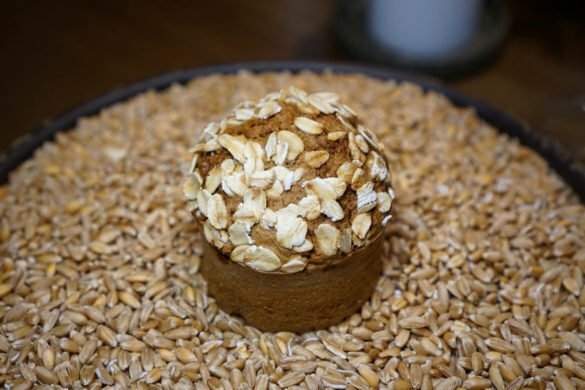 It’s billed as soda bread and cultured butter, but the best way we could describe it might be a bran muffin topped with oats. It’s golden syrup-y sweet on top, simple and delicious. 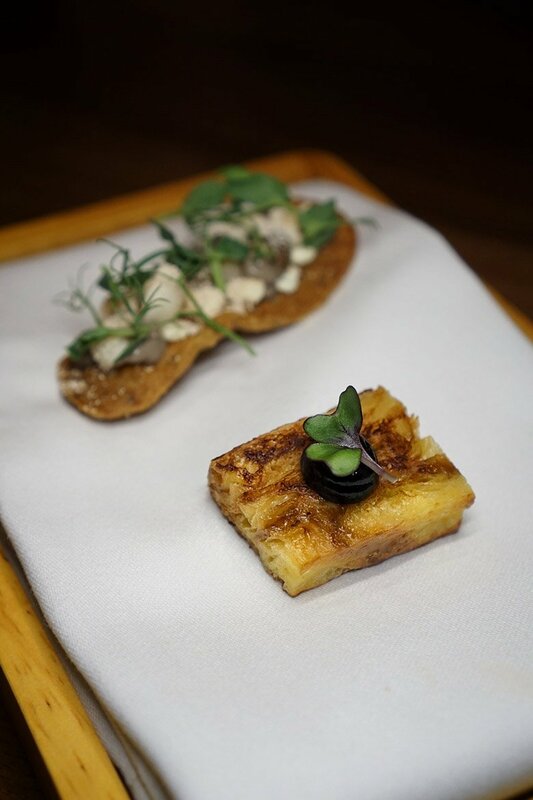 We ask for a second helping just so we can enjoy the glazed top half of the tiny bread over again. Probably the only muffin-like morsel we’ve felt is worth breaking any diet for. 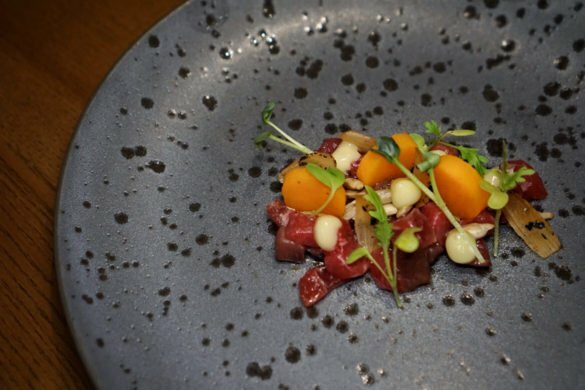 Aged raw beef, butternut and caper is up next, a modern take on beef tartare – and it’s, unsurprisingly by now, delicious. 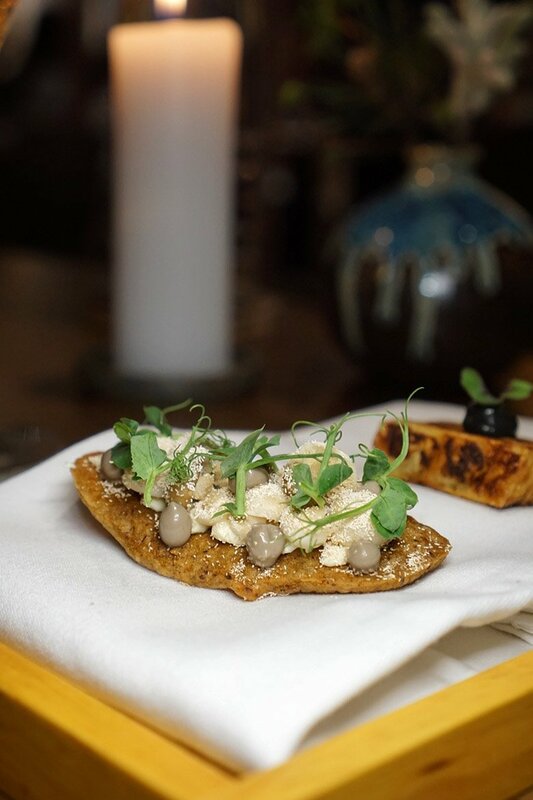 The grilled salad, Westcombe cheese, truffle, is also right up our alley. We love grilled lettuce and this salty, umami-yet-refreshing combo has just the right balance. We’d eat this all the time if we could. 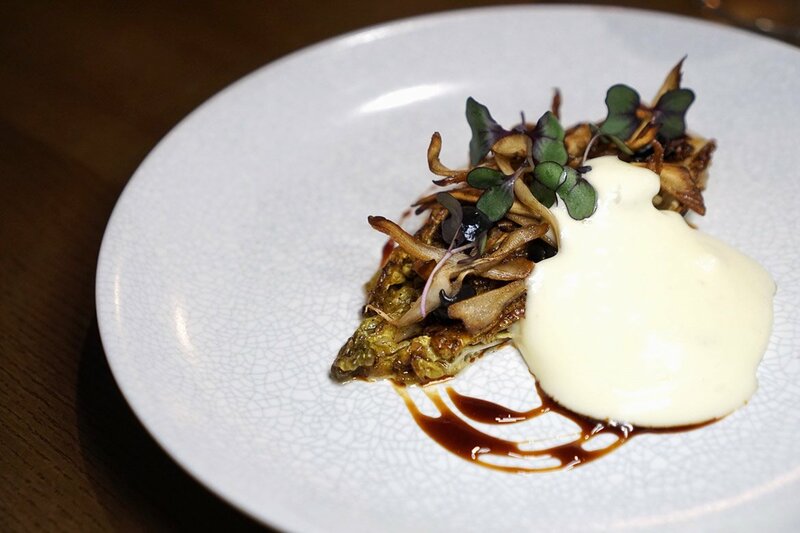 Dill brined cabbage, wasabi, teriyaki follows, and yes, it’s also wonderful. We’re starting to see a pattern here (as we’re sure you are also). The duck with turnip, spiced red vinegar is the biggest dish of the night, the ‘main’ of sorts, and it’s beautiful. It doesn’t need the hearty cheesy duck ragu that comes alongside, if we’re honest, it’s good just as it is. Don’t get us wrong, the ragu is amazing and we just want to steal it and toss it with some tagliatelle, but it’s a heavy dish at this point in the meal and we’re sad that we can’t do it justice. 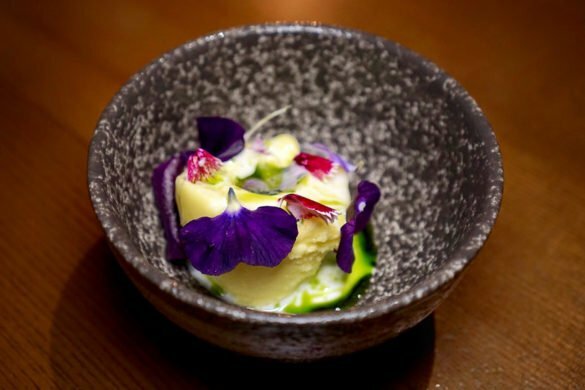 Yellow beetroot, buttermilk and mint is far more delicious than it sounds, and we also have an extra dish thrown in by the team – it’s English cheese, ice cream and raspberry. Sounds weird, and it is, but it’s surprisingly great. 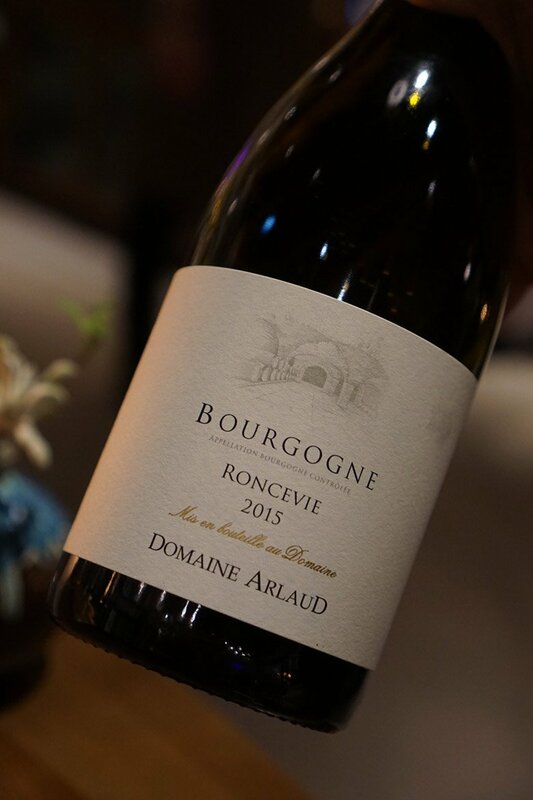 We love that Roganic isn’t afraid to push things a little. 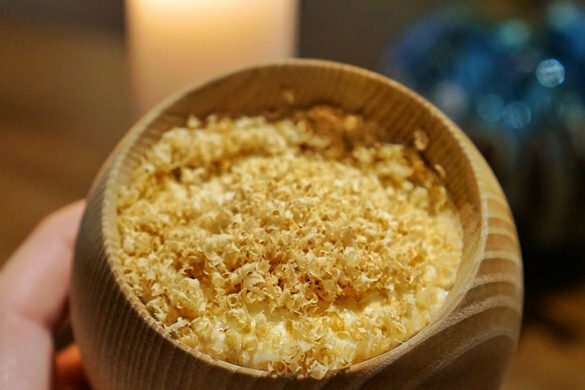 It’s a dish that reminds us of our fashion buyer days, when a Chinese colleague brought in ‘cheesecake’ – i.e., sponge cake, covered in cream and grated cheese. An unusual concept at first, but one that can work in the right circumstances. Our caramelized apple with juniper ice-cream shows a lot of technique in the finely sculpted apple tart, but we’d probably prefer more traditional vanilla bean ice cream to accompany it over the rather bitter juniper version. 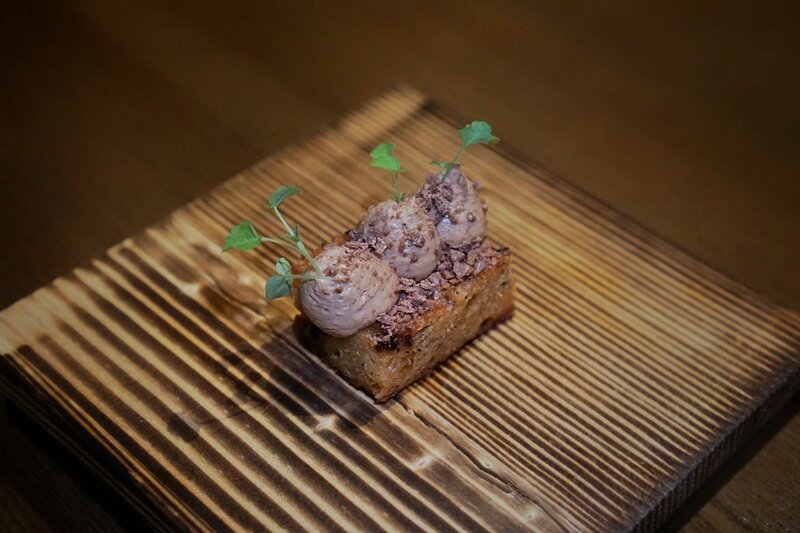 We like the concept, but need a little more sweetness from the ice cream to balance the dish. Earl grey, chocolate, cherry cake is surprisingly good considering we usually shy away from anything cherry, and the ‘doughnut’, dusted in pine sugar, is also great- but at this point, we’re too full to finish either. It’s a good time in the meal to hit the wall – really, this is a well-constructed journey. 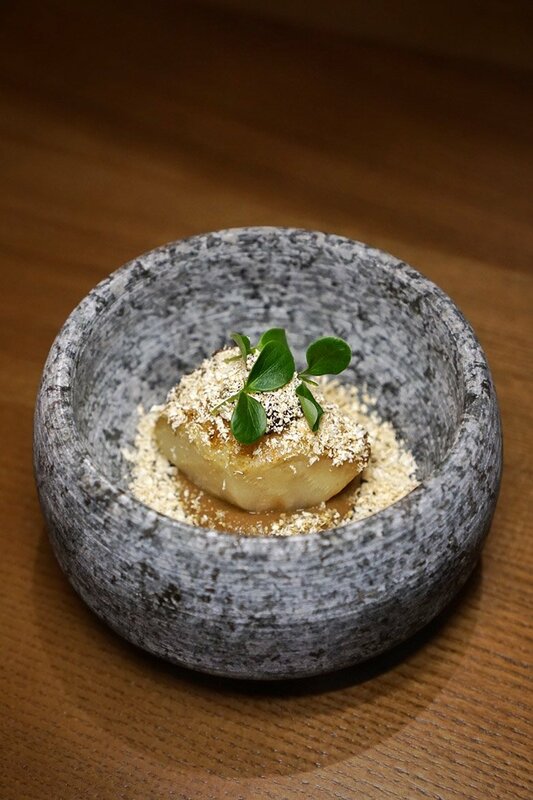 Throughout the meal, the Roganic team did a fabulous job of catering for our allergies (no seafood and some nuts), creating alternative dishes that felt more like superstars than substitutes. 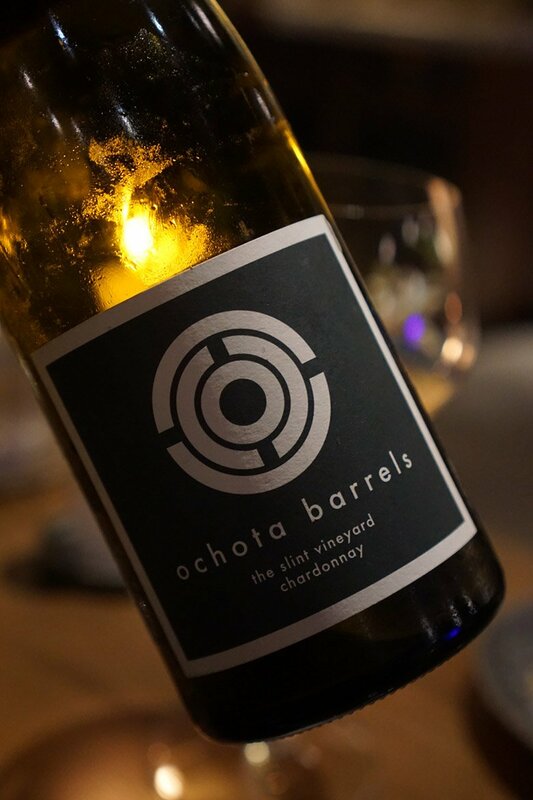 The wines on offer are also fabulous – we definitely recommend the wine pairing. 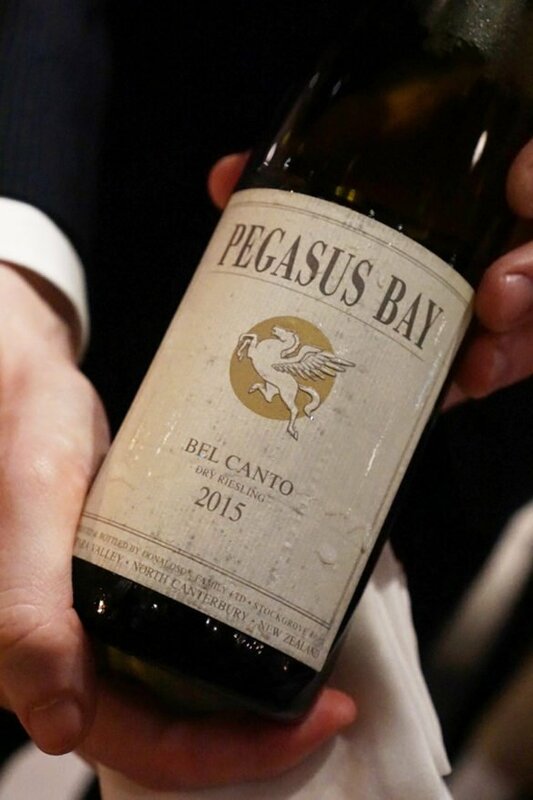 We were very happy to see New Zealand’s premier Bel Canto Riesling by Pegasus Bay feature, as well as Australia’s Ochota Barrels Chardonnay. Would we return? Unequivocally, yes. 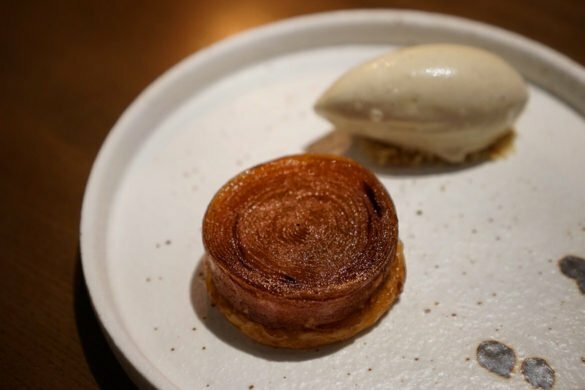 Roganic surprised us with its fabulous menu, service and drink pairing – perhaps now we might just have to venture to England to taste the original (or at least, return to Hong Kong to visit Aulis). 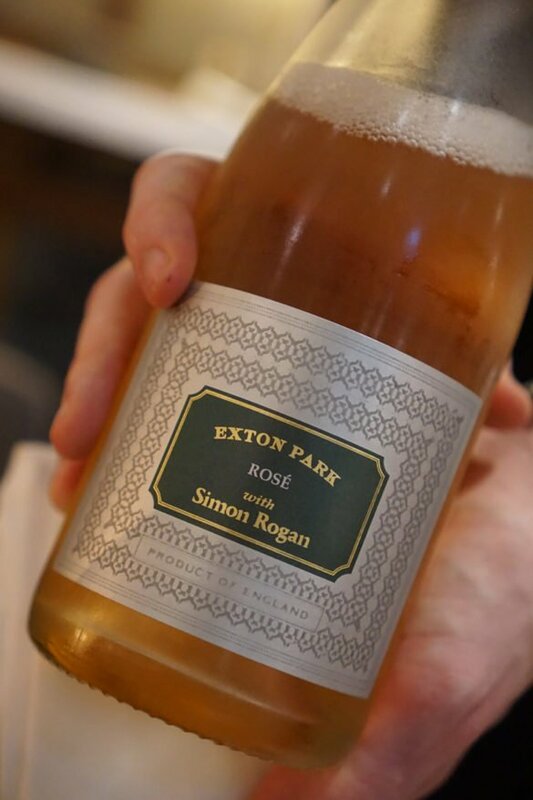 Have you been to a Simon Rogan restaurant?